Frank built his own table, or nest, for the Egg. This gives him plenty of work space to create smoky magic. I was first introduced to the Big Green Egg back in 2011. Our friend Frank had just gotten one and invited us over for brisket (which was delicious!). After many dinners at their house featuring food cooked on the Egg, I knew I had to have one. What makes cooking on the Egg an incredible experience is its versatility. Since I’ve had it, I’ve been able to smoke items – low and slow for hours – at a consistently low temperature. I’ve made several delicious briskets, a couple of pork butts for pulled pork. I’ve also used it to make my smoky babyback ribs and they turned out delicious too! I’ve used it for traditional grilling – burgers, dogs, veggies and pork tenderloin. Next I experimented with cooking at very high temps – 600F to 700F – to make restaurant quality steaks and perfectly seared ahi tuna. The most fun I’ve had has been making pizza. My Big Green Egg is a large. Mark got me a medium sized stone (12″) because we prefer smaller pizzas. This has really upped my pizza game and we rarely order in anymore. We can cook a pizza at 650F and get pizza-shop quality pizza every time. 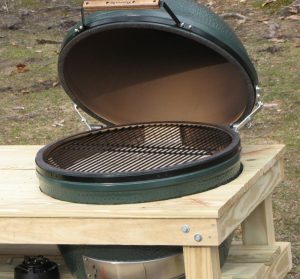 The Big Green Egg is a kamado-style cooker. Its dome shape and thick ceramic walls allow you to create the perfect environment for whatever style of cooking you want to do. The ability to vent the cooker – from the top or the bottom – allows you to really control the heat. A must-have is the ‘conveggtor’ which, when used, keeps the flames away from the food. I still have my gas grill and continue to use it but I now use it way less than the Egg. On my list of things left to cook on the Egg was a turkey. I purchased a small turkey back at Thanksgiving and stuck it in the freezer. I finally cooked it on the Egg. The whole family LOVED it. I cooked it at 350F-360F for about 2 1/2 hours. I threw in some apple wood chips and only used salt, pepper and butter to season the bird. Inside the cavity I did put some rosemary, thyme, sage and parsley. Here’s exactly how I cooked it. Please feel free to ask any questions or give me any suggestions in the comments section. I love my Big Green Egg! Great memories! Glad you are a member of the green egg club!